IT SAYS, I SAY AND SO STRATEGY adalah salah satu strategi untuk mengajarkan Reading kepada anak khususnya dalam sub Reading Comprehension. Strategi ini merupakan strategi yang menurut saya sangat efektif untuk di aplikasikan dalam kelas. Kenapa saya mengatakan hal demikian, karena saya sendiri sudah membuktikan strategi ini sebagai strategi experiment pada skripsi saya. Reading is one of important English skills that must be acquired well by all of English learners who want to learn English as a foreign language. It is one of the ways to know information and knowledge in the world. Reading can give some advantages to the students. First, reading will make the students to be someone who have wide knowledge. Second, it can improve the students’ ability that will support their study and will be used for them in daily life. Third, the readers will get some information and ideas from the sources that are needed for certain purposes, like answering question that related to the text and it is common activity that happens in the process of learning reading. In addition, the readers should have an effective way to comprehend the text in reading process. Therefore, in teaching reading the teacher should provide skills for the students about how to do an effective reading. 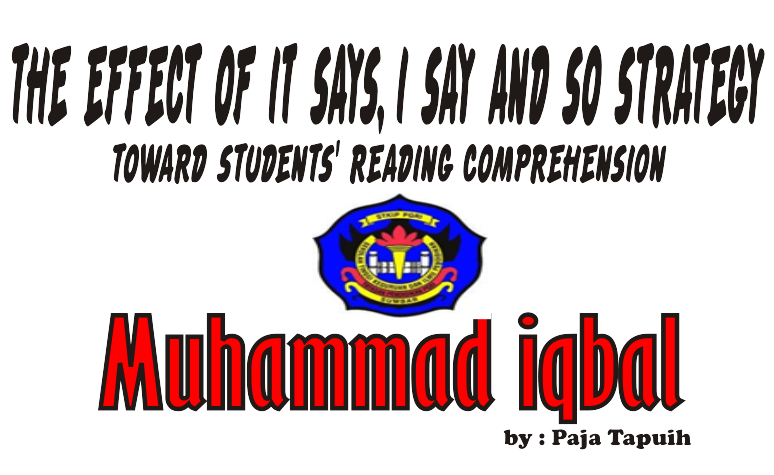 Furthermore, as stated in KTSP (Kurikulum Tingkat Satuan Pelajar) 2006 in second years students at junior High School, students have to be able to understand monologue text such as narrative, recount and descriptive in written form of daily life. It means that the text did not easy to be comprehended by students. Most of students got difficulties in comprehending the text. First, they just know the meaning of words but did not know implicit meaning that is stated from text. Then they got difficulty to find out the topic and identify the specific information of the text which they have read. However, based on the researcher’s pre-observation at SMP N 2 Panti the researcher found some conditions. First, the students would read the texts if the teacher asked them to read and then, when the teacher asked some questions related to the text, they could not answer it well. Then when the students found the difficult words in the text, they would skip reading and seem reluctant to continue it. They did not try to predict the meaning of words and sentences, although they had a chance to discuss the meaning of the words with their classmates or check it in their dictionary. Furthermore, most of the students also had difficulties to determine some information from the text, it occurred when the teacher explained the material, there were several students made noisy in the class. These conditions occurred when the teacher did not use appropriate strategy. It is proved that when the teacher used the strategy, she did not apply procedures of the strategy appropriately. For example, the teacher just gave the text and asked the students to answer questions of the text and collect it. Based on those problems, it is important for the teacher to provide good teaching reading strategy in making the students understand about what they read. The teacher has to find appropriate strategy that can be applied in order to create teaching and learning process run successfully. With the appropriate strategy, the teacher can make students interested in teaching and learning process. It will require students to be successful in reading comprehension. Based on the background of the problem above, it can be identified that the strategy that is used by the teacher did not appropriate. It cannot attract the students’ interest in reading, so the students feel reluctant to read and got difficulties to comprehend the text. Therefore, it is important for the teachers to use appropriate and effective teaching strategy which can be used to improve the students’ reading comprehension. Based on the problems above, there are several strategies that can be used by the teacher. First, KWL strategy (know, what to know, learned) strategy is the strategy in teaching reading about what they have know, what to know, and what they learned. Second, QAR strategy (Question-Answer Relationships) is a strategy that helps students in answering the questions through label of the questions. Third, It says-I say and So is a reading strategy by using a chart to guide students in constructing meaning from written text. Related to the various strategies that can be used to improve students’ reading comprehension. The researcher focused to see the effect of using It says-I say and So strategy towards students’ reading comprehension at eighth grade students SMP N 2 Panti, Kabupaten Pasaman. Based on limitation of the problem above, the researcher formulated the problem as follow; Did It says-I say and So strategy give significant effect toward students’ reading comprehension at eighth grade students in SMP N 2 Panti? It says-I say and So is a strategy that can be used in teaching reading comprehension. According to Hartmann (2006:22), It says-I say and So is a strategy helps students connect new information with prior knowledge through the process of making inferences. The researcher hypothesized that there is significant effect of It says-I say and So strategy toward students’ reading comprehension of eighth grade students at SMP N 2 Panti. The purpose of this research is to find out the effect of It says-I say and So strategy towards students’ reading comprehension at eighth grade students in SMPN2 Panti, Kabupaten Pasaman. The result of the research is to give contributions for the teacher, the students and the researcher. The first for the teacher, hopefully they can apply a new strategy for teaching reading comprehension. The second for the students, it is hoped to help students in comprehending the text, to make their comfortable in teaching learning process and to make them more active while studying. The last for the researcher, the researcher wanted to increase the knowledge and insight through this research. Effect is the result of It says-I say and So strategy toward students’ reading comprehension at eighth grade students of SMP N 2 Panti. Reading comprehension is the students’ ability in comprehending a text at eighth grade students of SMP N 2 Panti. It says-I say and So strategy is a teaching strategy which is applied to improve students’ reading comprehension at eighth grade students of SMP N 2 Panti.